An appointment can be made to see a doctor or nurse of your choice by calling 01453 825690. Alternatively you can book online via the link at the top of this page. Appointments are available during the evenings and at weekends nearby. Contact the practice for appointment availability. If you have a medical emergency, contact reception before 10:30 and you will be seen by a team member who may not be your usual doctor. It is usually possible to speak to a doctor on the telephone between 11:30 – 12:00, after morning surgery. However, our administrative team and receptionist staff can handle most non-clinical enquiries. 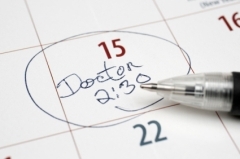 You do not require a doctor's Fit Note for any illness lasting seven days or less. Your employers may ask you to complete a self-certification form (SC2) which is available from your employer. For any illnesses lasting longer than seven days you will need to see a doctor for a Fit Note. If, despite this, you still feel that you need a Fit Note from your doctor during the first seven days of your illness, please note that there may be a charge for a private certificate. No Fit Note will be issued without an appointment with the doctor. If possible please try to telephone reception before 09:30 if you require a home visit.